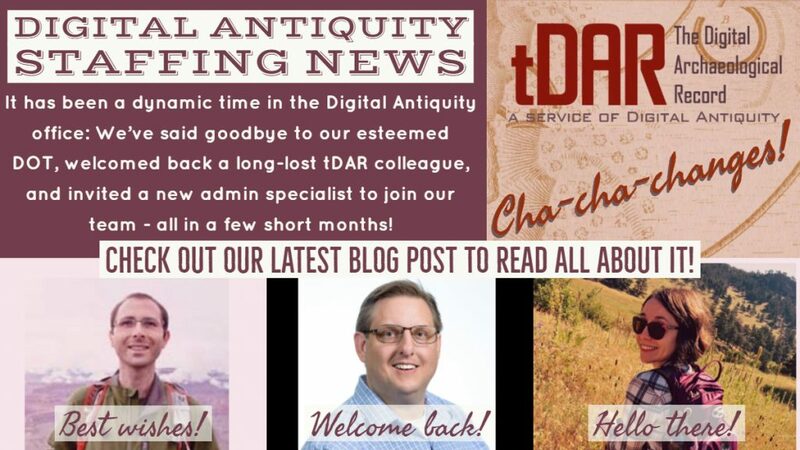 Digital Antiquity is pleased to announce some recent staffing changes. In November 2018, our long serving Director of Technology, Adam Brin, accepted a new position at the Getty Museum in Los Angeles, CA. Digital Antiquity is a small team of highly skilled people who, together, have built an amazing online repository backed by sophisticated data management services. None of that would have been possible without Adam’s work over the years. We will miss him, and wish him great success in his exciting new career with the Getty. When one door closes, another opens, as the saying goes. So it is with tDAR, as we now welcome (back) Digital Software Engineer Jim deVos. Jim worked at tDAR in the early days, and now has rejoined our team to help us move forward into our second decade. It’s an exciting time with several new projects in the offing. Jim’s background – from Qwest, to Honeywell, to the ASU Library and back to Digital Antiquity – brings a wonderful mixture of skills and experience that will enable us to continue to deliver the highest quality technical services. Also joining the tDAR team is Administrative Specialist Charlene Collazzi. Charlene has a strong background in archaeology, participating in fieldwork projects in Chile, Panama, and Egypt on the way to earning her Bachelor’s degree in Anthropology at UCLA. Before joining Digital Antiquity in December, she held various Administrative positions at the UCLA Medical Center and most recently at the Boulder County Land Use Department in Colorado. Charlene is in charge of our business processes, manages the office, and heads up tDAR communications duties including website and social media posts.